How many americans do you see picking fruits in the fields compared to the numbers of illegals? Do those americans get paid below the minimum wage with no benefits as the illegals? How many americans do you see working in landscaping out there compared to illegals? the illegals doing those jobs don't make "below the minimum wage". Exactly, no citizen would settle for the working conditions and the pennies illegals get. Illegals are exploited because your fellow greedy american business men rather give illegals jobs than others. Get mad with them. And the illegals are not greedy? Why do the come here again? Besides to make money and to have a kid or 5 to live off the government? I guess greed is one of the words! I am. Their insatiable greed has created this mess. Unfortunately, those who oppose their unethical/illegal practices are vilified. Haven’t you noticed? Don't know where you got that percentage but you just proved americans are more involved in those jobs. See? Then why have americans complain about illegals "taking their jobs" if they are the ones that dominate the numbers? Besides, americans woulnd't settle for a wage lower than the minimum wage with no benefits as illegals. The fact that 3% (or whatever the number is) of americans are "employed in agriculture" doesn't say ANYTHING about how many of them are out in the fields picking crops. The 3% applies to illegal aliens, not citizens. Which leaves a whopping 97% of illegals NOT picking crops. 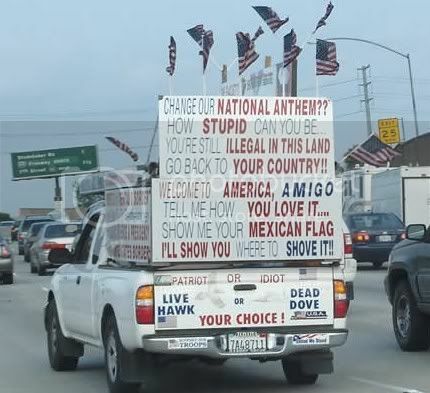 I see lots of american caucasians complaining about illegals taking their jobs but I am yet to hear about a caucasian that would like to work under the same conditions the illegals work at. Look at the pictures I posted and try finding just one caucasian . CindyJoel mentioned how americans work in agriculture, sure we can see that, but in the fields? I doubt it. Caucasians working inside a nice air conditioned office with electricity, computers, phones/fax, cold drinks, etc. That I can see . Here we go again! Americans may not want to make fruit picking a career but where those workers are needed there are unlimited visas for "legal" foreign pickers. Americans have always done landscaping jobs but those jobs dried up for Americans with the arrival of millions of illegal aliens willing to work for less. It is all about greed on the part of the employers, nothing more and nothing less. Before I bid you adieu and put you on my lengthy ignore list. This isn't just about caucasions. There are other Americans who are losing their jobs to illegals also. Why should any American work like a slave at slave labor wages in the first place? Why is it ok with you for employers to hire illegal labor? It is against the law! So you think that all Americans (I note that you pulled the race card by using only caucasians as an example) are working in an air conditioned office and none do or never have worked hard labor, blue collar jobs? Buh, bye! Last edited by chicagonut; 08-02-2011 at 04:16 PM.. The time I lived in the USA or whenever I visit I see uniformed mexicans working on landscaping just fine. With cars and trucks with the logo of the company and so on. Yet, no single caucasian there. 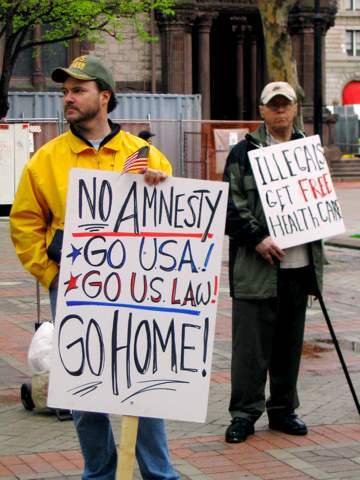 It's not that illegals took their jobs, it seems the job is "too dirty" for american caucasians. There are many jobs in the USA where you mostly see certain ethnicity. Nails? Vietnamese. Landscaping? Mexicans. Taxi? Middle Eastern. And so on and on. Why is it ok with you for employers to hire illegal labor? It is against the law! As I said in similar threads. I am not supporting illegal immigrants. I do find it silly for caucasian americans to complain how illegal immigrants "take their jobs" when they wouldn't even dare themselves to get their hands dirty in the same conditions illegal immigrants work and get paid pennies. I don't care if grandma has to be sent back to Eastern Europe, Asia, a Latin country, etc. If she's illegal, why should she be rewarded? Doesn't make sense. Nope, but the ones I mostly hear complaining about illegal immigrants are caucasians. As if they would want to work under the same conditions illegals work in those fields and with the same wages and no paid vacations, benefits, etc. Look at the news when they show "anti illegal imigrants" movements, the Arizona law, or simply against immigrants. All the caucasians with the signs and protesting. 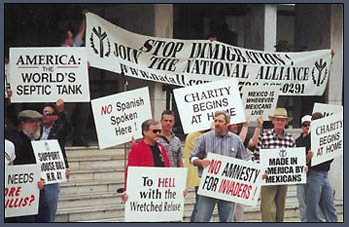 There are illegal immigrants from latin america, asia, middle east, europe, etc. bit still many of these protests are focused on latin people, specially Mexicans. Feel bad for them but hey, you have to play it fair and do things right by getting your papers in order before you think of crossing a border. Last edited by onihC; 08-02-2011 at 04:39 PM..